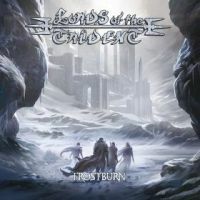 Madison, Wisconsin is home to Lords of the Trident – a metal band unlike any other in their local scene and beyond. Providing a dual emphasis on strong musicianship with a classic, traditional heavy metal platform that can be power/thrash-oriented one moment, and 80’s fueled the next – the quintet also throw an over the top element into their bombastic stage costumes and performances that feature everything from fire, swords, and armor to confetti explosions. A true all-encompassing entertainment odyssey that matches many of the adventure, battle, and fantasy lyrical topics covered by the band on all of their recordings. Shadows from the Past is the band’s latest full-length, possibly featuring their most sharpened attack to date. The willingness to assess where they have been and where they want to go in all facets of their output is admirable – and probably explains their fervent following that spreads over international waters. Reaching out by phone to vocalist Fang VonWrathenstein, you’ll discover more about the band’s philosophy, the attention to detail regarding their new album to be different than past efforts – and some thoughts on crowdfunding campaigns, Japanese toilets, and the ties between the gaming industry and heavy metal. Dead Rhetoric: Can you tell us your first memories surrounding music growing up, and when you gravitated towards the metal genre and eventually the desire to perform in bands? Fang VonWrathenstein: Well, let’s see. As someone that was born under a volcano, I gravitated towards metal instantaneously. We didn’t really know exactly what to call it- it wasn’t until I got adopted by barbarian parents that I ended up sort of learning the war cries and things like that so I started to feel the call of the metal. Every since then it’s been a quest of mine. For many years it was just heavy music, we didn’t exactly know what to call it. And now we have a nice moniker for it, and we have 700,000 sub-genres of all sorts of different metal out there. I will openly admit this, it wasn’t until Asian Metal and I started hanging out and living in the same space together- he’s got an encyclopedic knowledge of heavy metal, especially 80’s heavy metal. He’d start playing things, and he would explain to me how it was from this Judas Priest album, you can hear the influence of this producer- he really sent me to heavy metal school. Until then I was just listening to the music and banging my head- from there I sort of just dived into the genre a little bit more to discover the history of the genre while we were on our 750,000-year hiatus. I just love heavy music and have for most of my mortal life. Dead Rhetoric: And when did you know you had the calling to become a singer? VonWrathenstein: (laughs). It’s interesting. I think on that a lot in terms of all the people in all the bands that are known for a certain instrument, or multi-instruments. What was it exactly that made them go to that instrument- especially for drummers. I’d like to choose an instrument where I get to cart around 500 different pieces of equipment (laughs). For me, it’s all been a natural thing. I’ve sang and hummed to myself all along- I have always been a person who likes to be in the forefront of things. I do feel like I have a tendency to be the spokesman of things – leading the charge. Lead singer was sort of a natural fit. Getting my vocal chops together over the years and polishing that, has just added to it. I can’t really point to one specific instance or one specific thing- I came from a very musical, barbarian family. Singing was always a part of it. That’s a good question. 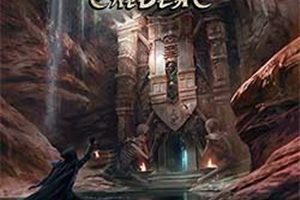 Dead Rhetoric: Shadows from the Past is the latest Lords of the Trident album – where do you see this record in comparison to your previous discography, and were there any surprises, obstacles, or challenges you had to work through from the initial conception until the final outcome? VonWrathenstein: I think this one really shows the influence of our two newest members Baron Taurean Helleshaar on lead guitar and Master ‘Herc’ Schlagzeuger on lead drums. Those guys have masters’ degrees in music, and they really bring a lot of nuance to the table. I feel like this album in terms of music-wise is a little bit more mature in the songwriting than previous albums. An interesting note is that when Baron joined the band, he made a spreadsheet of every single song that we had ever created, and he put all these data points in – when do the vocals come in, what key is it in, what’s the BPM, how long is it. For this record we looked at areas that we were specifically not doing. There are a couple of songs on this record where the vocals come in right away, there are a couple of songs on this record that are way faster than the majority of songs we’ve done before. And there are a couple of songs in different keys than we are used to. A lot of their influence shines through. Everybody has been pushed on this record musically. The songs this time around, there are really no simple songs. There are really no straight up easy songs, that we could play blindfolded, drunk, and backwards. Previously there were some songs that were a little bit more in our wheelhouse that we had a good grasp over. This album is a challenge to perform live. In terms of the surprises and how we went around making it, we didn’t have a specific concept of this record in general. There is no prevailing theme running through the record. This is a collection of songs we were writing in this three-year stint ever since we got a new guitarist and a new drummer. A lot of the interesting songs are songs that were brought to the table in auditions. For example, “Tormentor” is one of the songs that we had when we auditioned people we had them bring in a song they had written and teach us part of the song, to see how they write and how they interact with others. Personally for me I think this is our strongest record. We record all of the music ourselves in our studio that we put together- and over the years I feel like we’ve gotten much better at figuring out the right guitar tones, the right sounds that play well with each other to make a really full, heavy sounding record. This is an album that we can listen to sonically and say, ‘wow, this is really top of the line fantastic.’ This is definitely my favorite record so far. Dead Rhetoric: How did the idea to have Brittany Slayes from Unleash the Archers come up on “Burn it Down”? Have you always been a follower of her vocals and the band? VonWrathenstein: That’s a fun story. I believe it was in late 2015, we were opening for them on their tour as they were swinging by. They were playing in Milwaukee, and we are out of Madison, Wisconsin. Milwaukee is about an hour and half away from where we are- but we play Milwaukee frequently. We got the opportunity to play with them, and we hit it off really well with them, talking about all sorts of different things. Life on the road, Brittany and I talked about opera and our warm up techniques. We made a connection there. The funny part about it was, they were swinging through Milwaukee and I told them next time they come through Wisconsin, to really think about coming through Madison. They didn’t really have a great turnout overall. I would set up a show, they could stay with me, we could party, I’ve got a basement arcade, plenty of room, and Japanese toilets. And they said, ‘oh- you are the Japanese toilet guy’. They had been playing with all of our friends on this tour, and a lot of the bands we are close friends with and played with are opening on this tour. They told the band about staying with Fang and trying out these Japanese toilets. Next time you come through, please stay with us. They sheepishly looked at me and told me they hated to impose, but they didn’t have a place to stay tonight, and they were going to sleep in the van. I told them oh no, please come back to Madison- and they were on their way to Minneapolis, which is on the way. They came back, we got back to Madison around 3:30 am, and some of them stayed up the entire night and partying with Crimson Shadows, who were also on the tour. We got a fire going, we drank beer, just talking the whole night. I made them breakfast in the morning, and we all became close friends. Ever since then I’ve been talking to them online. It seemed a natural choice when we had a song with a female part into the concept of it. This song is about a witch burning from two perspectives- the perspective of the people that find the witch and from the witch herself. We needed a female guest vocalist and Brittany was my first choice. She said yes and she knocked it out of the park, fantastic vocals and I could not ask for anyone better than that. 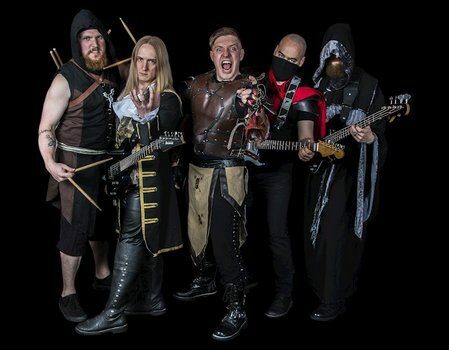 Dead Rhetoric: Tell us the importance of the stage names, costumes, visual representation of the group against the music – do you believe both are important to convey what Lords of the Trident is all about? VonWrathenstein: Oh absolutely. We get this question a lot- the stage names, the costumes, and for us it would seem insane for us to go outside without our armor on with so many people. We’ve had so many problems with attempted assassinations, and going out in jeans and a t-shirt, we might as well be naked with no armor on. On a psychological level, wearing the armor seems like a natural thing. To answer your question more directly, as a person who has been a musician for a millennia, has travelled around and seen all sorts of different bands. I can’t fathom how many bands I’ve seen live and played with – especially played with and watched an entire set of. There are so many bands out there that pay very little attention to how they present themselves on stage. And the thing is, a lot of people come from the perspective of if the music is good enough, I shouldn’t have to do anything- people should just gravitate towards the music organically and they aren’t going to care how I look. And that’s the stupidest mindset ever, a lot of the entertainment industry and live performance, we call it a show. If people aren’t showing anything, they are playing- but not showing. The problem I run into is I see a lot of bands, and they all run together. You hear a song, and what was the name of the band, and I can’t visually place them. A band like Peelander Z, or a band like Gwar, or maybe even Ghost- you look at a picture of one of those bands, and you will never mistake them for another band. You come to the show, and you randomly see these bands, that leaves a lasting impression. You can’t help but remember that band, they are so visually striking. So for us, walking that line to both paying attention to our music and also paying attention to what we do, on stage as a band is really important. Especially for me, because I go out and watch live music all the time. It’s very rare nowadays that you have anyone on stage that is actively entertaining the audience. It’s so rare to see a band that puts effort into a stage performance. A lot of the bigger bands do that or have done that in the past and that’s why they’ve gotten to where they are today. We wanted to have that draw that you have to see this live show- it’s insane, there are explosions, fire and confetti and swords and sparks. I also wanted to have music that was equally as strong. We get a lot of reviews where they see the pictures and think ‘oh, I don’t know about this band’, but then they listen to the music and see we are good. Dead Rhetoric: You’ve been very successful using crowdfunding campaigns for many of your latest product launches. How do you believe you’ve been able to succeed when other bands struggle to attain their goals in this arena? VonWrathenstein: I think that especially with crowdfunding like Kickstarter, a lot of the work – 90% of the work to run a successful Kickstarter campaign is actually in the prep before you launch. We spend months and months agonizing over the smallest little details of our Kickstarter prep. When we go for 30 days for a campaign, it’s only after 2-3 months of making things polished to work. We come from a very pessimistic viewpoint of how much money we are actually going to be making. I see a lot of bands out there, it’s their first record, and they ask for something like $7,000-$10,000 when they have 1,000 Facebook likes and maybe 500 followers on Twitter. That’s never going to happen for you- you may be able to make it viral by doing something insane but in general you have to think realistically. When we launched our first Kickstarter, and this is like a year after Kickstarter was sort of a thing, we did a launch for our EP Plan of Attack, and we only asked for $700. When we were going through the planning phases of that ask, it’s going to be tooth and nail up to the last days, we are never going to make $700 and we were going to have to throw a couple hundred dollars in ourselves to make it happen. And then it got funded in 24 hours! We overanalyze everything. We do a lot of math- how many friends and followers do we have, how much visibility our posts are getting on Facebook and Twitter. Of that reach, maybe 10% is going to see it and pledge- and the average pledge of that 10% is going to be $20. So we do all the math, and what’s realistic for us to shoot for – $3,000, $5,000, that kind of number. A lot of our success is based on that analyzing. Other bands try to copy something or they aren’t really doing the work before the launch, and that’s why you see people floundering because they don’t really have a plan. We always have a plan. Dead Rhetoric: Describe Lords of the Trident live in comparison to your studio recordings – what can audiences expect when they take in a performance? VonWrathenstein: Our live show is pretty intense. We do fire, explosions, confetti, and armor- in all sorts of fun events. It’s really a show and a performance. I don’t know the best way to describe – we put a lot of energy into making sure that the show is as good as the music. It is unlike 99% of the shows that you are likely to see in a live location, for a band that’s not a gigantic name. When you go to see Alice Cooper, Iron Maiden, or Judas Priest- you are expecting people to drive a Harley out on stage and have flames shooting out everywhere. In a local bar or seeing a traveling touring band, you are not expecting to see all the fireworks, explosions, and swords. We want to bring a show that people will honestly remember and will remember us quite vividly.